A “Tourtière” is a meat pie from Quebec, and is a classic part of the Christmas/Christmas Eve réveillon and New Year’s Eve meal (It’s also great when you are having a bunch of people over for dinner and you are sick of making “bangers in a cloud”, another great recipe that I will post soon). 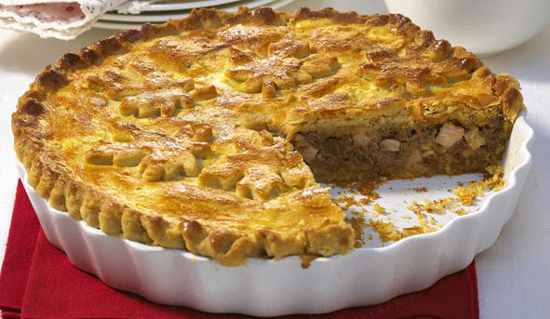 While meat pies are found in many cultures and parts of the world, the tourtiere gets its name from the the creature from which it was traditionally made, the “tourte,” or passenger pigeon. These days there is no one filling that makes a tourtiere what it is, it may be made from any type of meat, though the most common ones are made with pork, veal, beef, or a combination of meats (if you hunt dove, it might be an interesting way to prepare the bird, similar to the original recipe). In Quebec, serving this won’t turn heads, but in the US, tourtiere is not so common, and you may get some “what the… Meat pie?” type of comments. Ignore them, and remember… Knives are for threatening, too. This dish has a lot of flavor, and this is one of my favorite touriere recipes. When you try this, you will see why this is so popular up north. 2. Roll out your pastry dough and cut into two equal circles, enough to fit a 9-inch pie pan, and line the bottom of the pan with one piece of the dough. 3. In a pan, heat the oil and saute onion, garlic, celery, and carrot briefly. Add the meat and cook until done. 4. Drain the excess oil and add the stock, herbs, spices, and cognac to the pan and simmer over a low to medium heat for about 15 minutes. 5. Allow to sit for about 5 minutes and then spoon the mixture into the pastry crust in the pie pan and cover with the remaining dough. 6. Seal the pie crust, cut a few vents in the top, and design however you please (if you please). 7. Reduce the heat to 350 and bake the tourtiere for 25 to 30 minutes, until the top turns a golden brown. 8. Let cool for a bit and serve while still warm. This will easily serve 6 to 8 people and the proportions can be increased to be made in a larger pie mold (or pan). please feature bangers in a cloud! Looks delicious but seems like a lot of work to prepare. The crust in the photo looks amazing – I love that golden brown look. Oh yes, yes it is.